Immediately, I wondered if FCWB was a subsective compound — did this thing count as an instance of a Benedict, that is, as eggs Benedict? — or was its name resembloid, the dish merely (metaphorically) Benedict-like? (See the Page on this blog about postings on resembloid composites.) My immediate judgment was clear: for me, FCWBs are just too far from the BENEDICT category: the waffle too distant from an English muffin, the fried chicken too distant from a slice of ham, and anyway the thing came with maple syrup, as (soul-food) chicken waffles do, and sweet Benedicts are way over the line for me. But then I looked at recipes on the net, where the world of things called Benedict is far larger than my Benedict world, and where cooks make FCWBs and restaurants serve them. And I felt obliged to entertain the possibility that there are people who think that the BENEDICT category (with dishes called Benedicts in it) includes FCWBs in it. The answer to the query about the status of the compound might well be: resembloid for some, subsective for others. That wouldn’t be unparalleled. America is known for many a great thing: the Great Plains, Great Lakes, and even a Great Pyramid (in Bedford, IN). But nestled among these things lies greatness of another kind — calorie-dense chain restaurant food. The Center for Science in the Public Interest recently announced this year’s Xtreme Eating Awards, which are given out to the worst restaurant meals that pack more calories, saturated fats, and sugars into one meal than a person should likely consume in an entire day. 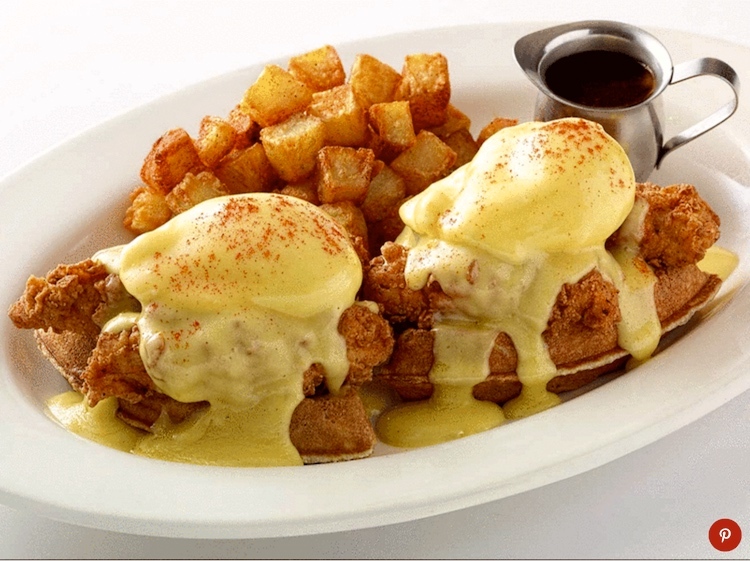 Among this year’s winners — Applebee’s Build Your Own Sampler and Marco’s Meal For Two at Maggiano’s Little Italy — was one gut-busting breakfast item, the Cheesecake Factory’s Fried Chicken & Waffles Benedict. This brunch bomb came in at a whopping 2,580 calories (nearly 600 calories more than the average man should consume in a day), 86 grams of fat (a four-day supply), and nearly 3,400 milligrams of salt (about 48 hours’ worth). … Even on a good day, the amount of calories in eggs Benedict is already pretty steep. A homemade serving clocks in at 715 calories, while your level of restaurant-style eggs Benedict calories can easily hit the thousands. … Most of the calories in eggs Benedict come from the Hollandaise sauce, which can account for as much as 500 calories in one serving. But when you include the calories in chicken and waffles, you’re hitting the 1,000 mark before you even poach your eggs. Clearly it’s the soul-food version we’re dealing with here. And it’s far, far from a slice of ham. Eggs Benedict … is a traditional American breakfast or brunch dish that consists of two halves of an English muffin topped with a poached egg, bacon or ham, and hollandaise sauce. (optional) garnish: paprika, chopped parsley, watercress, capers, grated cheese, etc. The variants in the base and middle layers range from small alterations that should excite no interest except from the strictest of recipe purists — sourdough toast replacing the (also) crunchy slightly sharp-flavored English muffin, a slab of smoked salmon replacing a slab of the (grossly unkosher but also smoked) ham, that sort of thing — to much more extreme replacements, in particular a pancake, waffle, or crepe in place of the muffin and a breaded and fried hunk of chicken in place of the ham slice. Starch for starch, and protein for protein, but that’s about it. So I think of FCWBs as only metaphorically related to actual Benedicts, despite the preservation of the poached egg and hollandaise sauce. I think of them as similar to Christmas roses (hellebores) vs. plants in the genus Rosa, calla lilies vs. plants in the genus Lilium, and the like. But I suspect there are people who think that a poached egg with hollandaise sauce, period, is a Benedict, and that FCWBs are just Benedicts with waffles and fried chicken as ornaments. This is not irrational, any more than thinking that (flightless) penguins, with their feathers and beaks and webbed feet, are birds and that (herbivorous) pandas, with their large bodies, fur, snouts, claws, and paws, are bears. For the foods I’ve been looking at, there’s no one who claims to have naming rights, to be acting as the authority on how labels can be used for these foodstuffs. Instead, the categorizations of the foodstuffs are picked up on the fly, tacitly, and the usage of the labels is like the usage of any other everyday lexical items (exhibiting considerable variation, uncertainty, shifting according to context, change, and contention). There’s plenty of room for people to end up with different systems. Even in the realm of biological classification, people operate with folk taxonomies that often diverge from the technical taxonomies (despite biologists’ claims on occasion that their classifications are the only correct ones). So far I haven’t encountered anyone who thinks that calla lilies are lilies; everyone seems to recognize the label as metaphorical in origin and in practice. But I have encountered a fair number of people who think that daylilies (genus Hemerocallis) are just a subtype of lily, so that planting a “lily bed” might involve Stargazer lilies (a Lilium hybrid), or Stella de Oro lilies (a Hemerocallis hybrid), or some combination of these. This entry was posted on March 2, 2019 at 9:37 pm and is filed under Categorization and Labeling, Compounds, Language and food, Subsectivity, Variation. You can follow any responses to this entry through the RSS 2.0 feed. You can leave a response, or trackback from your own site. Well, day-lilies are in the Lily family (Liliaceae), but then, so are onions and their fellow Alliums, which nobody would normally call “lilies”. I apparently have an inconsistent approach to food and drink names: I’m willing to accept calling anything topped with poached eggs and hollandaise a “Benedict”, but I strongly object to calling any alcoholic beverage served in a conical glass a “martini”.